In The Sermon of the Mount, Jesus taught his followers that they must "turn the other cheek" if ever they were struck by an enemy. When Jesus himself was being arrested by the soldiers of Rome, he did not defend himself. Peter drew his sword to fight for him, but Jesus commanded him to put it away. Then Jesus went willingly to be tried and executed by Pilate. However, Christianity became the state religion early in the fourth century, and roughly a hundred years later we find Augustine writing about the conditions that must be met for Christian warriors to fight for a just cause (p. 49-54). In The City of God, Augustine identified Cain as the first in a long line of human beings who have no inhibitions against killing. Consequently, those who belong to God's Kingdom are justified in defending themselves against the children of Cain. In the Medieval period, Christian crusaders focused on killing "the other" – the Muslim. In sixteenth century France, Protestants and Catholics slaughtered each other in The Wars of Religion. So a humanistic psychologist might be forgiven for asking a Christian: What has become of your commitment to The Prince of Peace? Charles Darwin's On the Origin of Species appeared in 1859, followed by The Descent of Man in 1871. In these two books Darwin argues that in order for any species to survive and give birth to the next generation, it must be able to evolve and adapt to environmental conditions. The alternative is extinction. Homo sapiens is not exempt from that kind of biological necessity. All too often, however, political and military leaders buy into a gross over-simplification of Darwin's insight: "only the strong survive." Instead, survival of the fittest more often turns out to be the deciding factor, not brute strength. 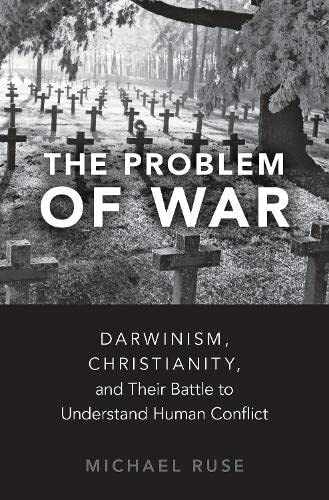 Robert Ardrey believes he is being true to Darwin's legacy when he argues that the development of weapons and the violence of war are imperative if you intend to defend your family and your territory from predators (p. 179). Frans De Waal's account of altruism and pro-social behavior among primates, however, suggests a different trajectory for Darwinian theory. Your chances of survival will be greater if you can learn to act in an altruistic way, sharing resources with others, refraining from violence, and forming friendly alliances (p. 188-191). Perhaps, then, a social psychologist will feel called upon to put a question to secular-minded Darwinians such as E. O. Wilson: Can you not see how much overlap there is between evolutionary altruism and the love command of Jesus? The two sides in the debate can profit from a mediator after their long history of mutual mistrust. Christians feel a responsibility to defend the account of creation found in Genesis. Darwinians reject it as fiction. They do not think religious beliefs should even be allowed into the discussion of human origins. People of faith believe that the universe was designed by a benevolent God and that they were created to worship God and enjoy fellowship with their Creator. Thomas Aquinas sees that as the ultimate end and purpose of human life. Darwinians are more impressed by the effect of random mutations on genetic material (The Blind Watchmaker of Richard Dawkins, p. 24-28). Traditional Christian ethics is opposed to eugenics, and while not every Darwinian is an advocate of eugenics, every eugenicist does seem to pay some kind of homage to evolutionary theory (Chapter 8: From Hitler to UNESCO). This conflict of interpretations has moved in new directions in recent exchanges between Steven Pinker and Nigel Biggar. In The Better Angels of Our Nature: Why Violence Has Declined, Pinker tries to show that the world is becoming a less violent place, thanks to various forms of social evolution. (1) The shift from hunting to agriculture has made war less likely because there are fewer famines. (2) The end of the Cold War has made nuclear war less likely. (3) Modern law enforcement practices have reduced the number of homicides. (4) Compared to the despotic regimes of the past, new constitutional governments are showing greater respect for human rights. However, in Biggar's book, In Defence of War, he argues that Pinker's claims about a "less violent world" are naïve (p. 206). When the Cold War ended, the leaders of many smaller countries took it as a sign that in a multi-polar world, they would be free to pursue their own violent agendas. Bush and Blair were right to invade Iraq, he says, because Saddam Hussein was a tyrant who showed no respect for human rights. The results of the invasion were far from perfect, but it would have been worse for them to do nothing. Yet, more than one war-weary soldier has pointed out that the law of unintended consequences still applies. The real "winner" of that war was Iran, which now has a freer hand to sow religiously-motivated conflict throughout the region. Even so, there are signs that a more constructive engagement between Christians and Darwinians on the question of war might be possible. There are Christian ethicists who do not follow the Augustinian paradigm. Among them is Stanley Hauerwas. His book, The Peaceable Kingdom, describes peacemaking as a virtuous practice (p. 171). For their part, Darwinians have observed that costly social signaling can function as a ritual that displays a preference for living together in peace rather than descending into violence. In this respect, The Problem of War is not a book that reaches one finished conclusion. It is likely to have its most creative effect on readers at the undergraduate level who are willing to explore many different approaches to questions about war and peace.